For varying thicknesses (thin and thick belts). Belt borders are completely sealed to ensure 100% protection. Cut resistant. B22UFTR, C20UF, NS20UFMT. Round & trapezoidal extruded belts. 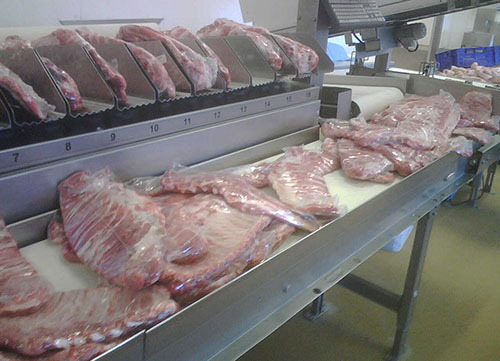 Apart from complying with the FDA and EU food quality, anti-microbial belt options are also available to help improve HACCP system management in meat and poultry processing plants. 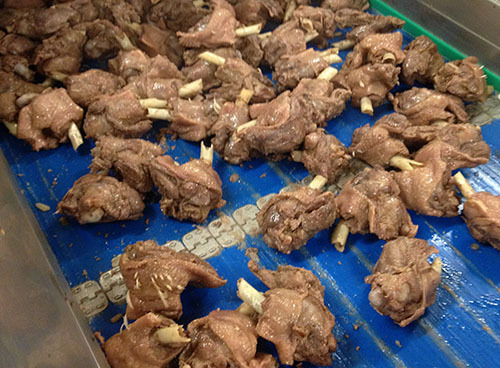 Application: Duck Confit processing line. The client used high-grade PVC food belts. Problem: Multiple creases and cracks appear on the belt. Former PVC belt lasted 2 months (max.) due to delamination caused by cleaning and the oils/fat. Solution: After installing esbelt NOVAK S 20UFMT, the belt´s working life was extended to almost 1 year. Packed fresh meat on CLINA belt. 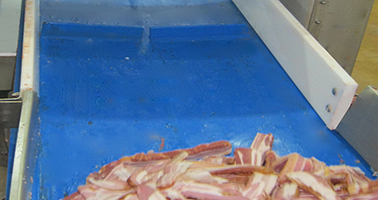 NOVAK S 20UFMT with cleats for conveying bacon. 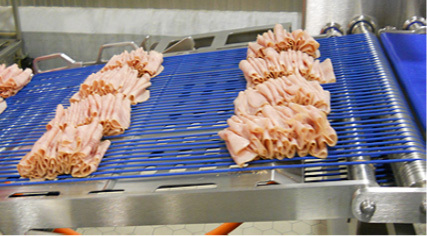 Sliced ham on round extruded belts.